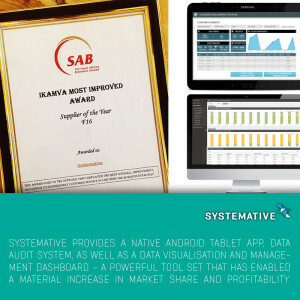 Systemative is a South African based software company. We engineer and maintain software solutions and products for clients, in Africa as well as Europe, North America and the Middle East. We deliver solutions that work and provide measurable results in line with your objectives and strategy. Find out how we do this. Contact us with your requirements for smartphone and tablet apps as well as web based software applications. Systemative was awarded the SAB Supplier of the Year 2016 award at a recent function for delivering extraordinary customer service in line with the business strategy. “Systemative have been absolutely superb in delivery across their sphere of contractual responsibility but also displayed strong leadership amongst their peers, our internal stakeholders and our customers. Undoubtable personal accountability in weekly and monthly deliverables comes to mind when I think about this supplier. A true partner in business.